2018 season seeks to break new ground. MANCHESTER — The Green Mountains will come alive with magnificent melodies for five weeks this summer, as the world-class Manchester Music Festival sweeps into the Northshire for its 44th season. The classical music soiree will bring a number of virtuoso veterans to Manchester, including violinist Stefan Milenkovich, pianist Vassily Primakov and violist Ara Gregorian. Locals and visitors will have the opportunity to enjoy performances by these festival favorites throughout the summer, as well as MMF newcomers, such as two-time Grammy Award nominee and Avery Fisher Career Grant violinist Jennifer Frautschi, Maestro Michael Stern and the Escher String Quartet. While the festival has a long history in Manchester, Neiman and others have worked fastidiously to make classical music accessible to all through free pre-concert lectures and relatively low ticket prices, ringing in between $33 and $45 per performance. Simultaneously, however, festival organizers hope to introduce a new echelon of visitors to summer in Southern Vermont. The festival will kick off on July 12 with works by composers including Beethoven, Tchaikovsky, and Neiman himself, who will appear on stage with Milenkovich, cellist Amit Peled, and clarinetist Vadim Lando. Continuing until Aug. 11 the MMF will feature five Thursday night concerts, two Saturday night concerts, four Sunday afternoon Young Artists concerts, an afternoon Family Concert, and an operatic young artists recital on Stratton Mountain alongside free preconcert programs. Telscher notes that there’s something for everybody at the Manchester Music Festival, though the two Saturday night concerts — taking place on July 28 and Aug. 11 — are likely to steal the show. The first, “A Night at the Opera” on July 28, will welcome four singers from the Metropolitan Opera alongside famed pianist and coach Warren Jones. The festival will conclude with the historically popular “Orchestral Evening,” led by Stern, conductor of the Kansas City Symphony for the past 20 years. 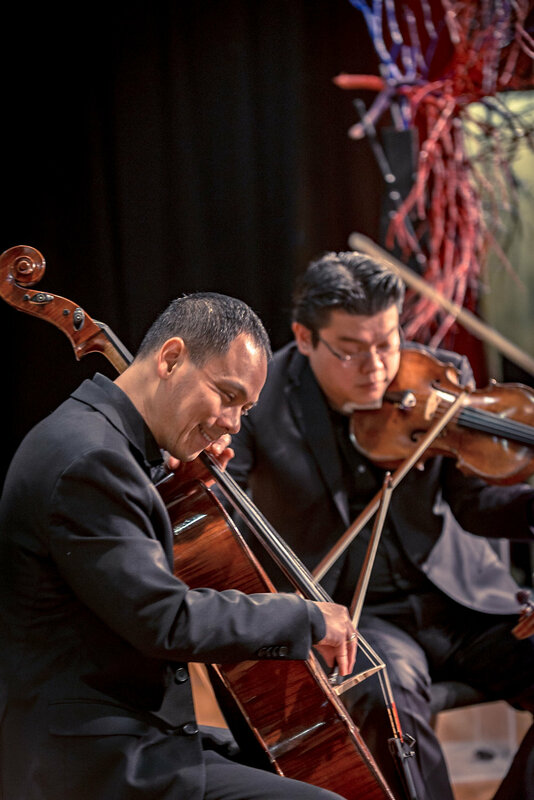 Grammy nominated Cellist Bion Tsang will be the featured soloist for the evening, performing Tchaikovsky’s Variations on a Rococo Theme for Cello and Orchestra, Op. 33. Perhaps the most exciting performances for Neiman, however, will be those from the MMF’s Young Artist Program, running simultaneously alongside the festival. Throughout the five weeks more than a dozen up-andcoming performers, awarded summer scholarships to study in Manchester, will take part in master classes and concerts right here in the Northshire. Tickets for these Young Artist Performances will cost only $10, Nieman notes, taking place at the Southern Vermont Art Center’s Arkell Pavilion at 2 p.m. on Saturdays. Thursday and Saturday evening performances will also take place at SVAC, with curtain times at 7:30 p.m. Pre-concerts programs will include rectial portions at 4:30 p.m. and talks beginning at 6:45 p.m, both freeof- charge and open to the public. For more information, and a full festival schedule, visit //www.mmfvt.org/.